The Rhodians transport Perseus’ bride from Syria to Macedonia, a move that angers the Romans. The censors Marcus Aemilius Lepidus and Marcus Fulvius Nobilior completed the census this year and registered 258.294 Roman citizens. Tiberius Sempronius Gracchus and Lucius Postumius Albinus celebrated triumphs for their victories in Spain the previous year. The two of them had brought back to Rome the grand total of 60.000 pounds of silver. Before leaving Spain, Gracchus had founded the town of Gracchurris, now Alfaro, La Rioja. Unlike Italica, founded in 206 BCE, this was probably not a town for Roman and Italian colonists, but for settlers from the indigenous tribes in the region. The new consuls were Marcus Junius Brutus and Aulus Manlius Vulso. The former was given Liguria as his province, the latter was sent to Gallia Cisalpina. He would later take charge of a war against the Histri that may have been unprovoked. There were serious problems on Sardinia this year. Rebellious Ilienses had formed an alliance with a group of Balari or Baleari, a tribe that had joined the Ilienses from the Balearic Islands west of Sardinia. The combined forces of the Ilienses and Balari were now ravaging the Roman province on the island, burning the fields and threatening the cities. The praetor commanding Sardinia, Titus Aebutius, was unable to stop them, as many of his soldiers were incapacitated by the plague which still ravaged this part of the Roman world. Aebutius and the loyal Sardinians decided to send envoys to Rome. Next year, a consul would have to take charge of the war. 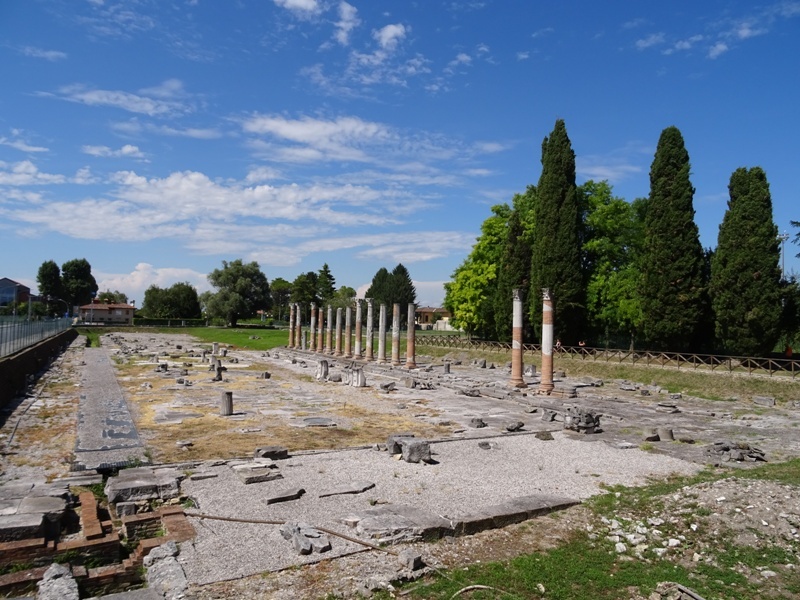 Remains of the forum of Aquileia. The casus belli for the Roman war against the Histri is not known with certainty (the opening part of Livius’ Book 41 is missing). It seems possible – likely even – that the Histri were again threatening the new Latin colony of Aquileia, which had been founded three years previously. On the other hand, the Romans may have just looked for a pretext to start a new war and annex more territory. In 183 BCE, the then consul Marcus Claudius Marcellus had wanted to invade Histria, but he had been stopped by the Senate. Aulus Manlius Vulso, however, decided not to consult the Senate. He wanted to achieve total surprise, hoping that the Histri were unprepared for his offensive. 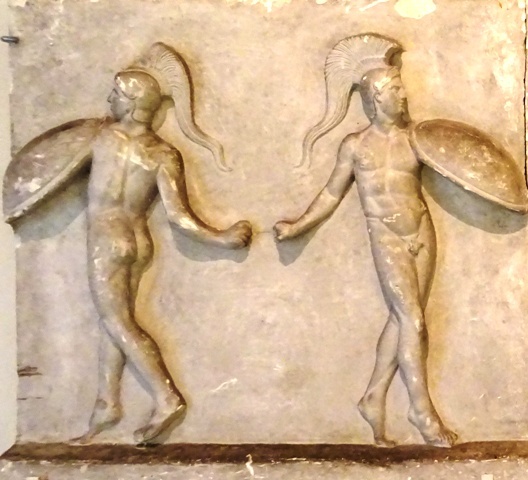 The consul left Aquileia and marched his army to Lake Timavus (somewhere close to the modern Timavo river in the Friuli-Venezia Giulia region). There he made his camp, close to the sea. The duumvir navalis Gaius Furius, who had been elected to patrol the sea in search of Illyrian pirates, supported the operation with ten ships in the Adriatic. The Romans seem to have been somewhat overconfident and had turned the camp into something of a marketplace. The Histri had followed their every move and waited for the right moment to strike. Concealed by the early morning mist, they charged at the pickets and caused a lot of confusion. The Romans – freshly levied recruits from Placentia and two more maniples – believed they were up against a huge force and panicked. The pickets fled back to the camp, where they caused more confusion. Soldiers dropped their weapons and started to run towards the sea to get on board of Gaius Furius’ ships. The consul tried to rally the men, but was ultimately forced to flee as well. Only a small band of Romans led by a tribune defended the commander’s tent in the camp (the praetorium), but they were cut down after a sharp fight. 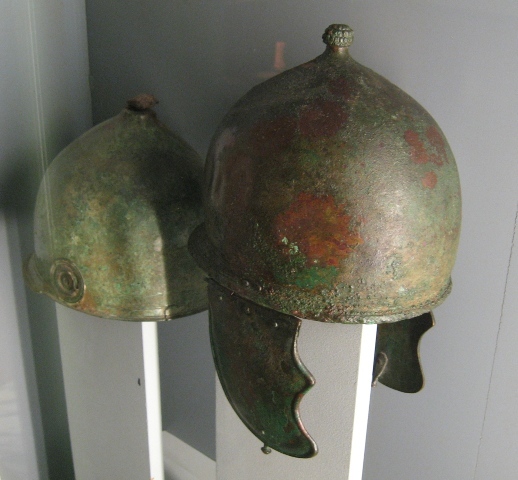 Bronze Roman helmet (Montefortino type; Allard Pierson Museum, Amsterdam). Fortunately for the Romans, the Histri now began celebrating their victory by consuming large quantities of wine and food that they had found in the camp. Vulso realised that his casualties had only been light and that it was still possible to turn the tide. He sent away the ships and succeeded in restoring order and reassembling his army. The only problem was that many men had fled without their weapons and armour, so the consul was now basically in charge of a largely unarmed mob. But then the third legion returned from a foraging expedition. A band of Celtic auxiliaries also reported for duty. The consul now decided to try and recover his camp. Livius reports that a standard-bearer flung his standard over the rampart, an effective method to get soldiers to attack. The camp was quickly retaken, as many of the Histri had passed out drunk. Just a few, their chieftain among them, managed to escape. The Romans had managed to turn an ignominious defeat into a crushing victory. But it was not a case of “all’s well that ends well”. Rome had already received word that the consul and his army had been annihilated, a rumour spread by two men who had been part of a supply convoy and who had seen the Roman camp in enemy hands. This later turned out to be untrue, but the consul Vulso was severely criticised for leaving his province of Gallia Cisalpina without permission from either the Senate or the Roman people. This is a fairly compelling reason to assume that the consul’s casus belli was rather weak. Two tribunes tabled a proposal to strip him of his command and to call him back to Rome immediately to answer for his behaviour. The proposal was vetoed by a fellow tribune, but Vulso’s reputation was dented nonetheless. This year, the Romans accepted Perseus as the new King of Macedonia, but their relationship with him was anything but warm. Perseus himself married Laodike, daughter of King Seleukos IV Philopator. The marriage obviously served strategic purposes. Macedonia and the Seleucid Empire had been allies in the past, and through his marriage Perseus sought to strengthen the ties with the Seleucids and bolster his position vis-à-vis the Romans. However, there was a problem with getting his bride to Pella, the Macedonian capital. Under the terms of the Treaty of Apameia (see 188 BCE), Seleucid ships were prohibited from sailing west to Macedonia. Therefore the Rhodians offered their help and sent several ships to take Laodike from Syria to Macedonia in state. This was a move that aroused suspicion with the Romans, who believed that the Rhodians were helping a potential enemy. The Romans retaliated – somewhat childishly – by upholding a complaint from a group of Lycians. 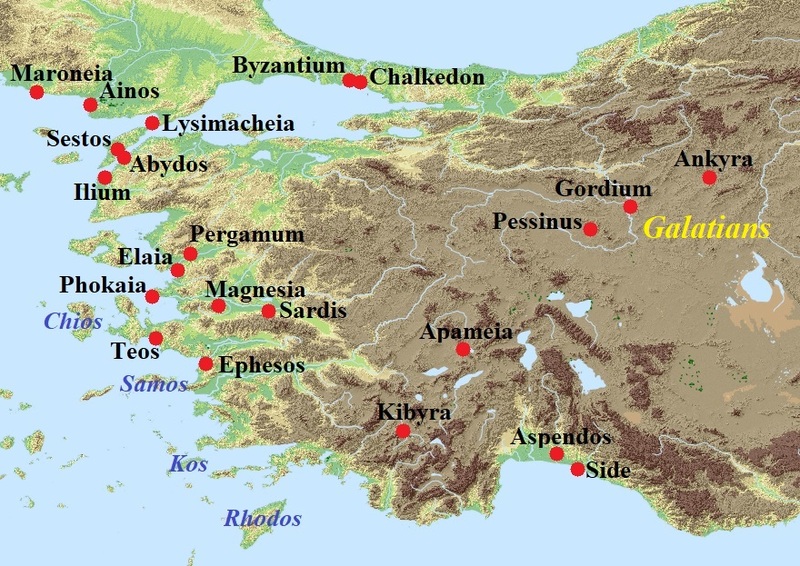 Lycia was a region in Asia Minor directly opposite the island of Rhodos. Citing the aforementioned Treaty of Apameia, the Rhodians claimed it for themselves. The Lycians sent a delegation to the Senate and, during a meeting that was possibly held in September of this year, accused their neighbours of harsh treatment. The Senate decided to interpret the treaty differently and judged that the Rhodians were in the wrong: Lycia had not been granted to them, the Lycians had merely been designated as friends and allies of the Rhodians. It was a decision that was almost certainly motivated by frustration about the Rhodians’ help for Perseus. A Roman delegation was sent to Rhodos to announce the Senate’s decision to the leaders of the island. These would not be pleased. Polybius, The Histories, Book 25.4.